The Omnilux™ system was developed after 12 years of extensive medical research. The product line available at Naz'Rene Clinic & Skincare includes Omnilux blue™, Omnilux revive2™, and Omnilux plus™ for the treatment of a wide range of dermatological conditions including, acne, wound healing and pain management. Additionally, the scientifically designed light source is very safe and does not have harmful UVA or UVB rays. Medically Omnilux™ therapy can be incorporated into the management of the following skin conditions: psoriasis, dermatitis, eczema, the calming of rosacea, the acceleration of wound healing, reduction of scarring and can be used in combination of topicals to manage vitiligo. Treatments sessions start at 250GHS. 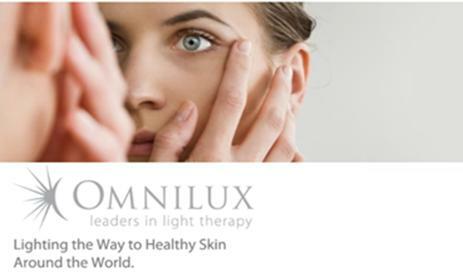 How Do I Schedule an Omnilux™ Light Therapy Session For My Skin Concern? Naz'Rene Clinic & Skincare’s medical skin care team delivers high tech, innovative, effective and minimal downtime ways to achieve beautiful and healthy skin. If you’re looking for more information on Omnilux™ Light Therapy or any other medical service At Naz'Rene Clinic & Skincare you can continue browsing our website to learn more. If you have any questions regarding your face and body treatment options you can reach us at our office in Kanda, Accra, Ghana +233(0)302906393. Servicing the following areas: Accra (Tema, Adjinganor, McCarthy Hills, Airport Hills, Airport, Residential Area, Cantonments, Dzorwulu, East Airport, East Cantonments, East Legon, Kanda, Labone, Ringway Estates, Roman Ridge, Osu, Ridge, Spintex Road, Tema, Tesano, Trassaco Valley, West Airport), Kumasi, Cape Coast, Tamale, Sunyani, Takoradi, Ghana, Ivory Coast, Lagos, Abuja, Nigeria, Abidjan, Liberia, Burkina Faso, Togo, Guinea.